Frank Juarez, co-founder, of the Randall Frank Contemporary Art Collection was interviewed by Brainard Carey from Praxis Interview Magazine on wybcx Yale Radio regarding the artist grant program. The collection started in 2015 with Randall E. Baren, which supports artists living and working in the East Coast and Midwest. This collection continues to explore ways in which they can support one of our most creative assets – artists. In addition to art acquisitions and sponsorship they have created an artist grant program aimed to support artists financially for residencies, exhibitions, and artist-led lectures. 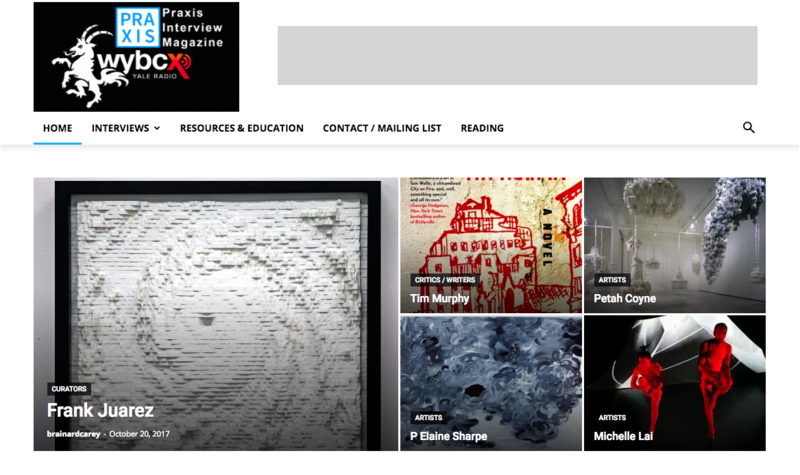 Praxis is a two person collaborative that was formed in 2000 and was first featured in 2001 in PS1/MOMA’s Greater New York show, and in 2002 they were in the Whitney Biennial for their visual art and a series of performative actions. They are a husband and wife team – Brainard and Delia Carey. After numerous other shows, Reina Sofia, MOMA, Whitney solo show in 2007, they began a new artist project – building an institution, MONA, (The Museum of Non-Visible Art). MONA is currently interviewing artists, curators, and writers from all over the world, as part of an artist-built institution and a social practice. Over 600 interviews have been conducted so far – The Archive of interviews is here.